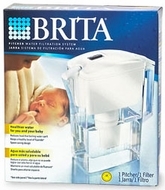 The Brita Baby water filter pitcher is specially designed to protect your infant from lead and other pollutants that can be especially harmful to infants and children under six. The Model 35528 Brita Baby Pitcher reduces 98 percent of lead and up to 99 percent of other harmful contaminants, but won’t strip your tap water of fluoride important to your infant’s bone health development. A built-in reminder on this Brita 1.5-quart capacity pitcher lets you known when to change the filter. It’s a welcome baby shower gift. We’re number one in affordable, healthy home products at Today’s Concept.